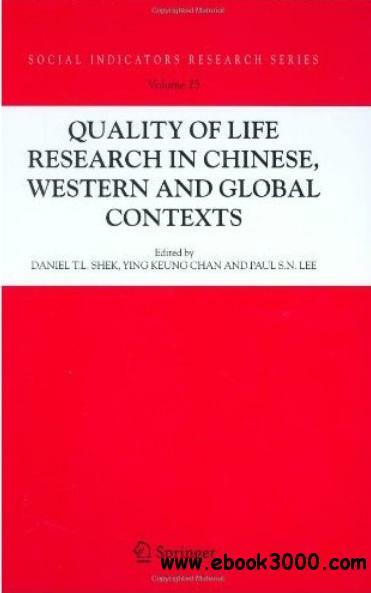 Quality-of-Life Research in Chinese, Western and Global Contexts - eazydoc.com | Free eBooks Download - EBOOKEE! The majority of studies on the quality of life have been conducted in Western contexts and are based on Western participants. Comparatively speaking, there are only a few studies that have been conducted in different Chinese contexts. Also, there are fewer QOL studies based on children and adolescents, or studies that examine the relationship between QOL and economic disadvantage. In addition, more research is needed to address the methodological issues related to the assessment of quality of life. This volume is a constructive response to the challenges described above. It is the first book to cover research in Chinese, Western and global contexts in a single volume. It is a ground-breaking volume in which Chinese studies on the quality of life are collected. The book includes papers addressing family QOL, quality of life in adolescents experiencing economic disadvantage, and methodological issues in the assessment of QOL. It is written by researchers working in a variety of disciplines. No comments for "Quality-of-Life Research in Chinese, Western and Global Contexts - eazydoc.com".